The event administrator has closed online registration for this event. You can still register on site before the start of the race! Packet pickup will be held on Friday (2/23) from 11am to 6pm at Running Wild, 611 S Palm Canyon Drive, Ste 10, Palm Springs (located in the Desert Sun Center). 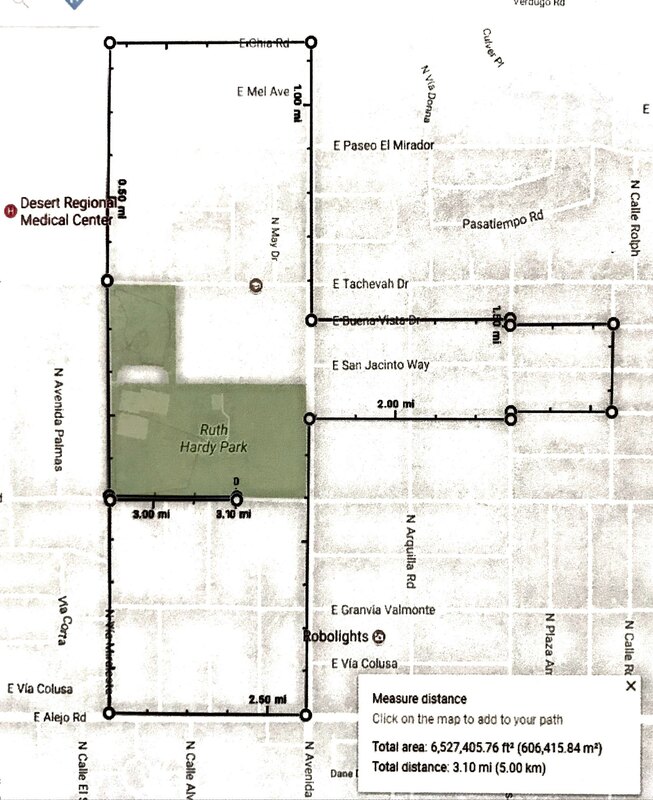 You may also pick up your packet the morning of the race (2/24) starting at 6am at Ruth Hardy Park. WE ARE HONORED TO ANNOUNCE: THE RUNNING FROM THE LAW RACE HAS BEEN SELECTED AS THE HOST OF THE LAW ENFORCEMENT 5K NATIONAL CHAMPIONSHIP. THERE WILL BE OVER $1,500 IN PRIZE MONEY AWARDED TO THE TOP 3 MALE AND FEMALE, SWORN LAW ENFORCEMENT FINISHERS. 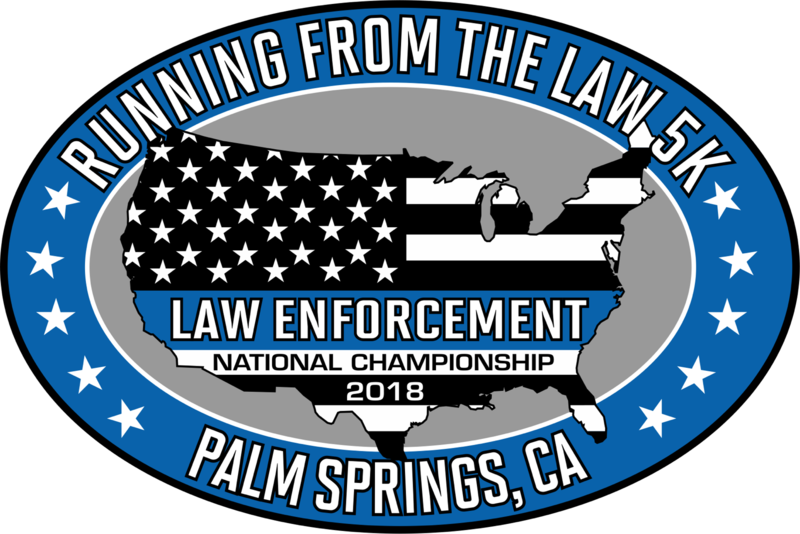 THE CERTIFIED COURSE IS A 3.1 MILE (5K) LIVELY RUN/WALK THROUGH THE OLD MOVIE COLONY NEIGHBORHOOD AND SPONSORED BY THE PALM SPRINGS POLICE OFFICERS' ASSOCIATION. THIS EVENT WILL SUPPORT THE PALM SPRINGS OFFICERS' MEMORIAL FUND. A unique and fun design on front and back of shirt will be given to all registered participants. This shirt is a must-have! Plenty of parking available at Ruth Hardy Park and in the surrounding community. ALL FINISHERS WILL RECEIVE A TERRIFIC FINISHER MEDAL AND T-SHIRT. AGE GROUP AWARDS WILL BE PRESENTED. The race starts and finishes at Ruth Hardy Park and takes you through the charming Movie Colony neighborhood. Flat and fast course. SWORN LAW ENFORCEMENT MUST PRESENT A VALID LAW ENFORCEMENT IDENTIFICATION CARD PRIOR TO THE RACE TO COMPETE IN THE LAW ENFORCEMENT CATEGORY AND TO BE ELIGIBLE FOR THE PRIZE MONEY. RACE DIRECTOR WILL HAVE THE FINAL SAY AS TO AN INDIVIDUALS ELIGIBILITY AND THEIR DECISION WILL BE FINAL. LAW ENFORCEMENT PERSONNEL WILL NOT BE ELIGIBLE FOR AGE GROUP AWARDS. WHEN REGISTERING PLEASE LIST THE DEPARTMENT WHICH YOU ARE CURRENTLY EMPLOYED UNDER THE COMPANY TAB. DOGS, STROLLERS, AND WALKERS ARE WELCOME TO PARTICIPATE TO IN OUR EVENT. WAIVER: I, the undersigned accept full responsibility for myself and for any injuries I may incur during this Running from the Law - Law Enforcement 5K National Championship event. I have read the application and I fully understand that participating in this event may be dangerous to my health. Sprained ankles and wrists, lacerations, bruises, broken bones, insect bites, collisions with vehicles, hypothermia, and heat exhaustion are possible. I fully understand that there may be no medical or emergency personnel on the course. I have trained sufficiently for this event. I will not hold any of the organizers, landowners, the City of Palm Springs, sponsors, or any agency within the state of California, or any volunteers responsible. My actions and mishaps are accountable to no one but myself. I agree to withdraw from the race if so instructed by a race official. I grant the race organizers the free use of my name, and any photos or videos of me for any use related to the race they see ﬁt. I acknowledge that my entry fee is non-refundable, even if the race is canceled because of an act of nature or mankind.